My family Christmas lunch is always pretty vegetable heavy, but I like to have some kind of mock meat to go with our vegetables so it feels like a classic roast dinner. 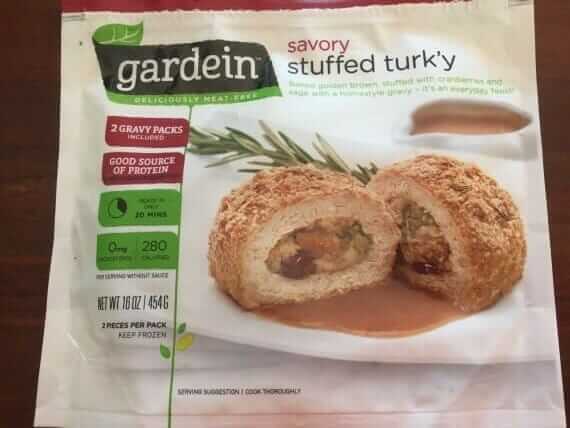 This year I found the roast of my dreams, the Gardein stuffed turkey. I’ve tried others before but found them disappointing and too salty. The Gardein one is great, with good texture and flavour. I like the other Gardein mock meats, particularly the beefless burger, so I had high hopes. I wasn’t disappointed. The pack includes two small vegan turkey roasts stuffed with cranberries, sage and lots of other goodies, encased in breadcrumbs. They were a perfect size for the two vegans at our lunch. It comes with some packets of gravy, but I ditched those in favour of my own pimped up gravy that I often make to go with roast veggies. I use the Massel super gravy granules. I cook the gravy with only 3/4 of the water specified and replace the other 1/4 of the liquid with soy milk after it is cooked. I also add dried porcini mushrooms and crispy fried onions in the cooking mix. At the end I stir through a spoonful of the botanical cuisine lemon and dill cheese. This gives a creamy gravy with strong umami flavours that I love. It is so good. Unfortunately I don’t have a photo of the roast because I ate it before I thought about blogging. All I had left was the packet! We had our usual vegetables of Toulouse Lautrec gratin of pumpkin, roast potatoes, green beans and glazed turnips. All smothered in gravy of course! Love gravy – this sounds like a delicious Christmas meal – Trying again with comment!